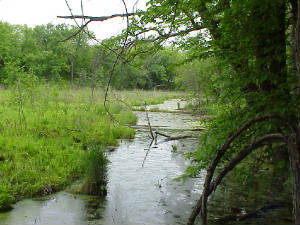 Over half of the total wetland area of the lower United States has been lost since European settlement. Wetlands have been drained for farming, residential development, business development, and road expansions. Our remaining wetlands are often impacted as well by current human activities. Very few undisturbed wetlands exist. In Minnesota, 80% of our state's surface water is classified as a wetland (excluding Lake Superior). Yet, most of our resources, time, energy and money, are directed toward lakes and streams. Wetlands provide a wide variety of functions that protect the quality of all of our waters. The value of wetlands is far-reaching! Filter. They filter pollutants and excess nutrients out of water, as it soaks into the ground. Sponge. They absorb stormwater and heavy snowmelt, reducing the risk of flood. This slow absorbtion also allows for much of the water to soak through the soil, recharging our ground water supply. Nursery. Many species of amphibians, mammals, reptiles and birds rely on the safe wetland environment to raise their young. Wetlands often lack the large fish species and other predators that may feed on their young. Hotel. Many migrating waterfowl, shorebirds, and songbirds rely on stopping at wetlands during their migrations in the spring and fall. Wetlands offer a wide variety of high protein organisms for them to feed on, allowing them to refuel. Home. In addition to the other wildlife mentioned, countless small organisms (insects, worms, snails, leeches, crustaceans) and plants make wetlands their home. Wetlands offer a very unique habitat. Recreation destination. They provide beautiful views and plenty of opportunities for recreation (birdwatching, canoeing, hunting, exploring). WHEP works with volunteers, scientists, and local governments to evaluate the health of our wetlands and to work toward their protection. This is a dragonfly nymph. different levels of human disturbance. By learning "who" is in our wetlands and their abundance, we can determine the quality of our wetlands. Certain species of plants are more tolerant to poor water quality than others. Certain plants will flourish in healthy wetlands, while others will not occur at all. Volunteers inventory plants in selected wetlands. Their findings are then used to determine the health of the wetland. 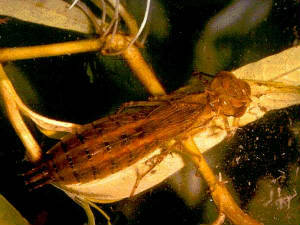 Both plants and macroinvertebrates are identified, counted, and then used to measure the wetland health through a type of scoring process called the Index of Biological Integrity, or "IBI" for short. Click here for more information on the IBI.